We weren’t entirely feeling up to seeing another temple after seeing so many in Hong Kong and India, but that tourist guilt lingers when you skip out on a sight you know you should see. 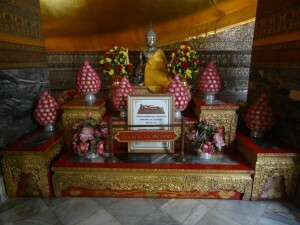 So we put those “bad tourist” temptations out of our heads and headed to the bus stop to see Wat Pho, aka: Temple of the Reclining Buddha. Taking the bus there felt straight forward and we like to think we can manage local public transportation fairly well, but not this time. After an hour of searching for the bus stop and waiting for the appropriate bus that would never come, we gave up and went for the more expensive tuk tuk option. At least we made the attempt, right? 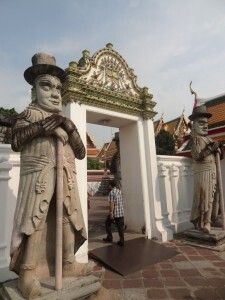 Arriving at the temple, we were told by what seemed like a knowledgable local that we would not be able to enter with our shorts and that we must wear pants. Then he proceeded to tell us other places that we could go instead. This all seemed suspicious – like something was in it for him. So we entered the temple anyway just to be sure and *shocker* there was a plethora of tourists wearing not only shorts, but sandals as well. If your outfit is too provocative, then they have a robe you can use to cover up. So we assume the guy had to be a cab driver wanting to drive us elsewhere. 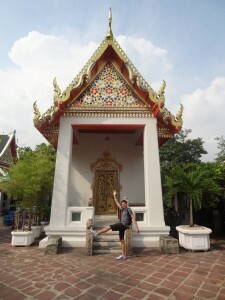 That minor setback resolved, we continued to explore the temple, even with our scandalous calves exposed! 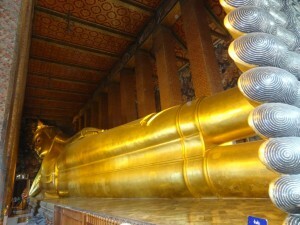 Without doubt, the Reclining Buddha is massive and impressive to behold. This is not like seeing “temple after temple” and we were really glad we went. 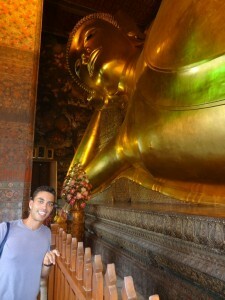 The Buddha itself is 15 meters high and 43 meters long. 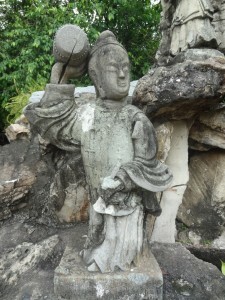 The grounds around the area are gorgeous as well and offer perfect sights of a traditional Thai style architecture. Once we were done meandering around the complex and felt that we had our fill, we attempted to take the bus again back to our hostel only to give up after waiting 20 minutes. So we found another tuk tuk and of course our bus just happened to show up as we drove away. Damn our lack of patience! 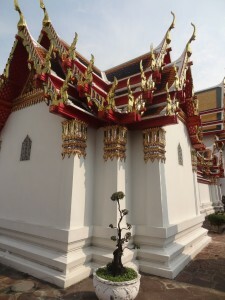 To see the rest of our photos from our week in Bangkok, click here. Ya it’s true, not expensive. Just wish it would have come on time. Well the tuk-tuk was cheap as well – just wasted on hour in the whole process.